Gays in the Military May Cause Disaster | RabbiLevin.com - Fighting for Morality! Rabbi Yehuda Levin warns that natural disasters such as Haiti and 9-11 are linked to promiscuous behavior and homosexual excess based on ancient knowledge. Initiating an open "gays in the military " policy will hurt out military and may cause further disaster. SHAME ON YOU - WHAT AN INSULT TO JEWS EVERYWHERE!!! BY YOUR DISGUSTING LOGIC YOU THINK THAT THE HOLOCAUST WAS CAUSED BY HOMOSEXUALITY AMONG THE JEWS? YOU THINK THE GREAT ISRAELI ARMY, WHICH HAS OPENLY SERVING GAYS IN IT, IS COURTING DISASTER!!! SHAME. SHAME. SHAME ON YOU. I HOPE YOU LIVE A SAD, PAINFULLY LONG LIFE FOR ALL THE HORRORS YOU ARE INFLICTING WITH YOUR HATEFUL SPEECH AND CONDUCT. A 'RABBI' - MY FOOT! You make me ashamed of my Jewish identity. You are a sick indivual to imply that people are collateral damage when G-d punished homosexuality. Your G-d is not the G-d of the Jewish nation. Rabbi Levin - I'm a gay man and don't spend so much time hating over people. That makes me more moral than you'll ever be. Rabbi- Ugliness, hatred and superstition follow you around like a black cloud. You contribute nothing to the world and indeed make it a darker place. I'd say shame on you but I believe you have no shame. Hello people, I just signed up on this brilliant forum and wanted to say hello! Have a amazing day! Rabbi! Keep up your good work!! you make me proud to still be frum! Great job Rabbi! I wish more Catholic Bishops spoke the way you do! you truly are an inspiration! As a Gay Jew, I am doubly offended. YOU are the Disaster! Do ultra-Orthodox serve in the military? 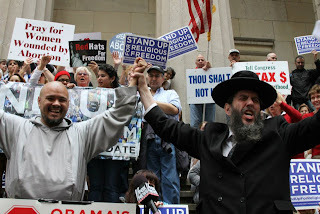 Or are they too busy collecting welfare and reading the Torah?